Includes 4'x4' Frame and 6 patterns, Half Dome, Domino, Sun Scratch, Open Window and Split Door. Window Patterns are durable and lightweight. 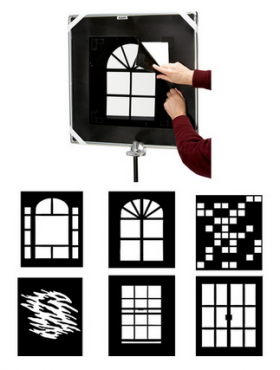 Designed to work with Chimera Panel Frames. Ability to combine two patterns with the frame holder. Can also be used in combination with color gels. Comes complete with a frame, holder, duffle and six patterns, plus a clear pattern for logos, etc. 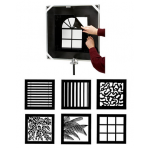 Window Patterns work with both strobes and continuous lights. Use focusing lights to create more pronounced detail. Frame size is 48 x 48" and the window size is 22 x 22"